With Super Bowl Sunday quickly approaching, the year's most expensive advertising campaigns are starting to get rolled out, and Doritos' latest features an unlikely collaboration between Chance the Rapper and the Backstreet Boys. 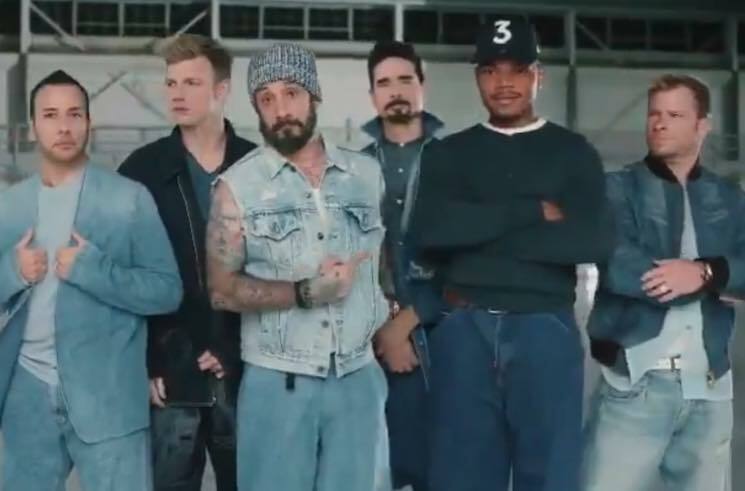 The boy band teased a tiny clip from the upcoming Flamin' Hot Nacho flavour spot on Twitter, which sees Chance awkwardly inserting himself into the BSB lineup. Unfortunately, he seems to be the only one that didn't get the Canadian tuxedo memo. The video clip is accompanied by the hashtag #NowItsHot. Check out the teaser ad below, and stay tuned for plenty more cringe-worthy celebrity ads in the weeks to come. As previously reported, Super Bowl LIII takes place February 3 in Atlanta. Maroon 5, Travis Scott and Big Boi will perform at the halftime show.